Do you like Disney Redheads Boho Hairstyles? Share it with your friends. 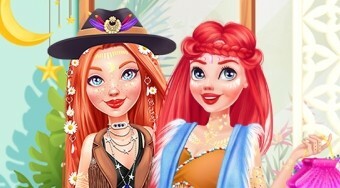 Disney Redheads Boho Hairstyles is a wonderful girl game featuring the main characters of popular fairy-tale princesses and great friends Ariel and Merida. Your task is to choose both hairstyles, shorts, clothes and fashion accessories in boho style, which is very popular for this summer.